This modern 3 bedrooms, 2 bathrooms unit is situated in the popular holiday destination Manaba Beach, with a stunning sea view and walking distance to Lucien Beach. The open plan kitchen/dining room leads in to the modern open plan living room. 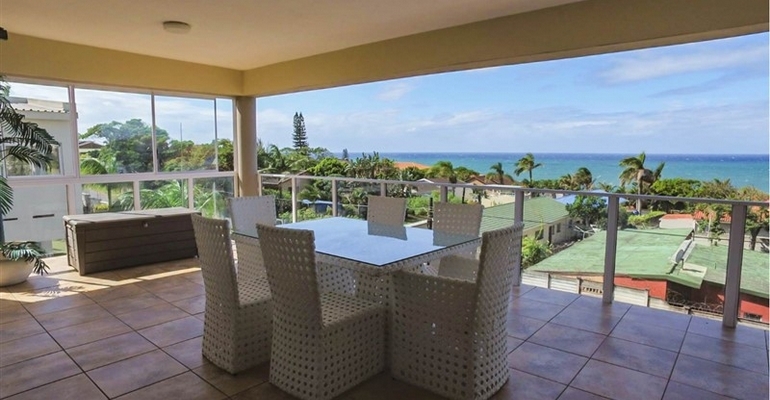 The living room leads to the large balcony with private braai facilities (Gas Braai), patio furniture and a stunning sea view. The kitchen is well equipped for all your self catering needs and also has a dishwasher, washing machine and tumble dryer. The main bedroom has a Queen size bed and full en-suite bathroom. The 2nd bedroom also has a Queen size bed. And the 3rd bedroom has two single beds and shares the 2nd full bathroom. The complex is fully walled and has an electric gate, there is one lock up garage with an additional guest parking. For those hot summer days there is a communal swimming pool for you and your family’s enjoyment. There are several activities in and around Manaba Beach such as Lucien Beach (Blue Flag beach), scuba diving, shark cage diving, deep sea fishing or whale and dolphin watching in Shelly Beach, and many more to choose from. Breakage Deposit: R1500.00 (refundable within 7 days of check-out, subject to inspection of apartment). DSTV optional extra: R30 per day.